Supercharger II - Nutritional Swine Fat Supplement - ORIGO - Supplier of High-quality animal fats and vegetalbe oils. Supercharger II is designed to easily add needed energy to a pig’s diet. Studies have shown that lactating sows will eat to meet their energy requirements. Therefore, improved feed efficiency through additional fat equates to less consumed feed. 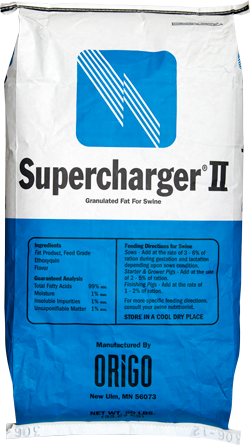 Supercharger II is used to increase energy density without the negative effects of grain products. Supercharger II provides higher energy level in sows resulting in less weight loss and a decrease in days to weaning and rebreeding. Supercharger II fed before farrowing and during lactation has shown to increase baby pig survivability. Supercharger II is easy to handle similar to our other dry fats.